Of the many things kids of all ages and backgrounds face every day, bullying, unfortunately, is one of the most prevalent shared experiences. In a large-scale effort to address the issue, October has been designated National Bullying Prevention Month. Frederick Frederickson has a food-chain theory about life. There are lions, like the school bully. Gazelles, like the bullied kids. There are meerkats, and the fleas that live on the butts of meerkats. Frederick’s a flea. His troop mates at camp are terrifying. But a tenuous friendship grows between them—which is lucky, because a Category 5 hurricane is coming, and everyone will have to work together to survive! Julian Twerski isn’t a bully. He’s just made a big mistake. So his English teacher offers him a deal: if he keeps a journal and writes about the terrible incident that got him and his friends suspended, he can get out of writing a report on Shakespeare. Julian jumps at the chance. He writes about his life in sixth grade, but he can’t bring himself to tell the one story his teacher most wants to hear. From the day she arrives at quiet Mica High in a burst of color and sound, Stargirl captures Leo Borlock’s heart. She sparks a school-spirit revolution, and the students of Mica High are enchanted. Then they turn on her. She’s suddenly shunned for everything that makes her different, and Leo, panicked and desperate with love, urges her to become the very thing that can destroy her: normal. Lewis “Shoe” Blake is used to the joys and difficulties of life on the Tuscarora Indian reservation in 1975. What he’s not used to is white people being nice to him—people like George Haddonfield, whose family recently moved to town with the Air Force. As the boys connect through their love for music, Lewis has to lie to hide his family’s poverty from George. He also has to deal with a vicious bully, who makes Lewis the special target of his wrath. Annabelle has lived a mostly quiet, steady life in her small Pennsylvania town. Until the day new student Betty Glengarry walks into her class. Betty is a bully. Though her bullying seems isolated at first, things quickly escalate, and reclusive World War I veteran Toby becomes a target of her attacks. While others have always seen Toby’s strangeness, Annabelle knows only kindness. She will soon need to find the courage to stand as a lone voice of justice, as tensions mount. Lucky Linderman has been the target of Nader McMillan’s relentless bullying for as long as he can remember. But he has a secret escape: his dreams. There, he goes to the war-ridden jungles of Laos, where his grandfather, who never came home from the Vietnam War, is still trapped. There Lucky can be a hero. But how long can he keep hiding in his dreams before reality forces its way inside? “Blubber is a good name for her,” the note from Wendy says about Linda. Jill crumples it up and leaves it on the corner of her desk. But Robby grabs the note, and before Linda stops talking, it has gone halfway around the room. That’s where it all starts. Bee is an orphan who lives with a carnival and sleeps in the back of a truck. Every day she endures taunts for the birthmark on her face. One day a scruffy dog shows up, as unwanted as she, and Bee realizes she must find a home for them both. She discovers a cozy house where two mysterious women, Mrs. Swift and Mrs. Potter, take her in. They help Bee realize that she matters to the world—if only she will let herself be a part of it. 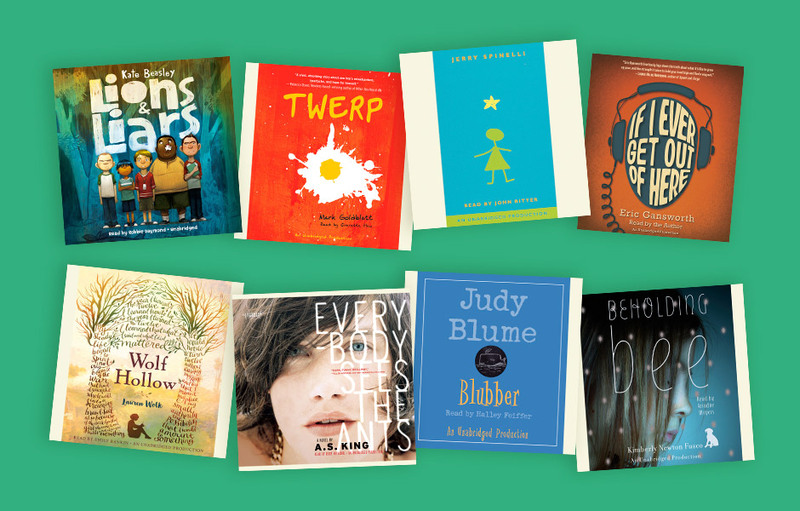 For more audiobooks to share with young listeners about bullying, take a look at this collection.